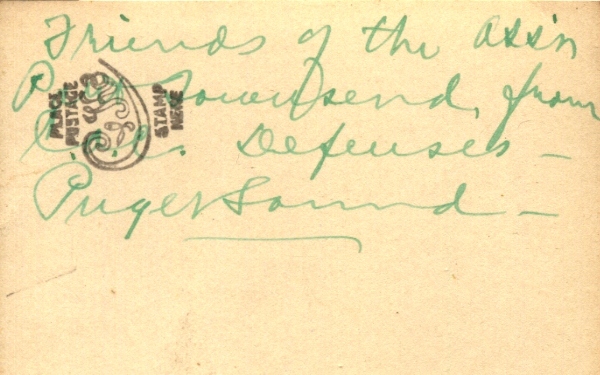 Coast Defenses of Puget Sound, c. 1912. The inscription on the back seems to read "Friends of the assn Port Townsend, from C.A.C. Defenses - Puget Sound." In 1914 the Coast Artillery Corps companies of this command were the 26th, 30th, 62nd, 63rd, 71st, 85th, 92nd, 94th, 106th (Mine), 108th, 126th, 149th, and 150th (Mine). There was also the 6th Band. Headquarters was at Fort Worden. 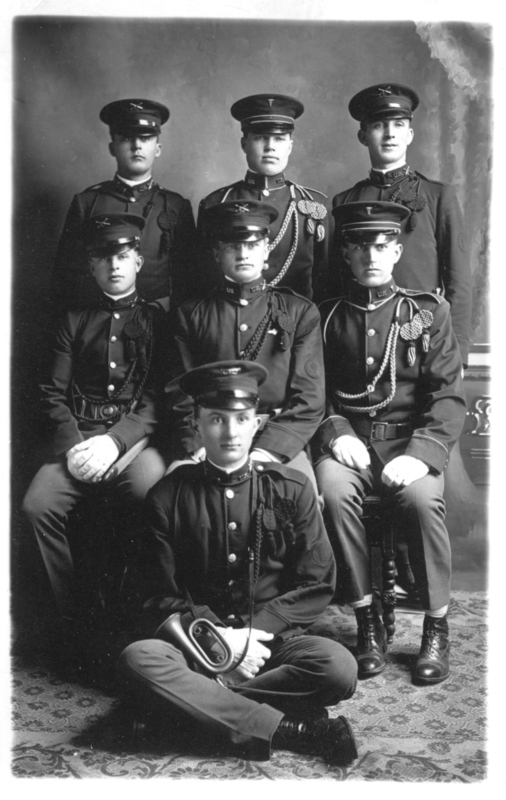 This group portrait shows coast artillerymen, including a bugler, and two privates of the Hospital Corps, all in 1902 dress uniforms. Note the white and maroon breast cords of the Hospital Corps men compared to the all red cords of the artillerymen. Cap insignia: Coast Artillery (looks like the 106th Company—might be 108th but the man has a mine company patch so 106th makes more sense), bugler (the straight trumpet introduced in 1905), and a caduceus of the Hospital Corps on a cap with a white and maroon band. Collar insignia: Four examples of Coast Artillery. 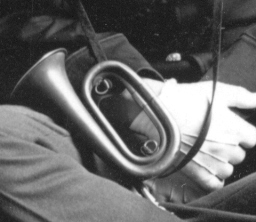 Collar insignia, "U.S" and the Hospital Corps caduceus; the bugle; larger view of the 106th insignia; one man wears a U.S. buckle. Qualification badges: First Class Gunner (gun companies), First Class Gunner (mine companies). Both were red on dark blue.